At CMC we offer world class archive storage racking in London which incorporates the talents of a multi skilled work force and a company with a wealth of experience in the archive storage field. As one of a leading number of UK archive storage racking and shelving suppliers, CMC are able to offer archive storage of the highest quality. Our company has been built around a personal, efficient and fast service. In the years since our creation we have established an impressive customer base and many of our customers return time and time again. As well as archive storage racking, we provide various types of storage equipment including pallet racking, longspan shelving, Dexion shelving, slotted angle shelving and British standard shelving. All these services culminate in The Shelving Centre being perfectly placed to provide archive storage of the highest quality. The importance of secure archive storage cannot be under estimated. The right choice in design and the type of shelving materials we supply can often make a huge difference and our experience is vital in this respect. 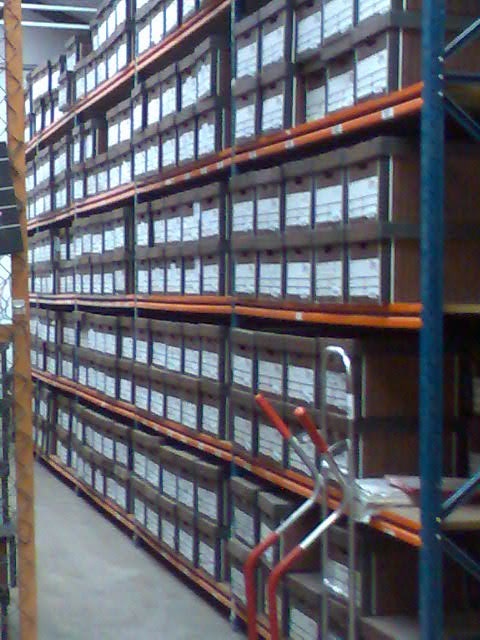 The Shelving Centre guarantees archive storage racking that has been built as safely as possible. We will be more than willing to visit your business to assess your archive storage racking requirements. If you would like anymore information regarding any of our archive storage shelving in London then please feel free to contact us, we will be pleased to answer any queries you may have.